Manta Flow deployed in Teradata-based environments helps to improve data lineage, fulfill regulatory compliance, and manage off-loading projects, eventually maximizing the value of your data warehouse. 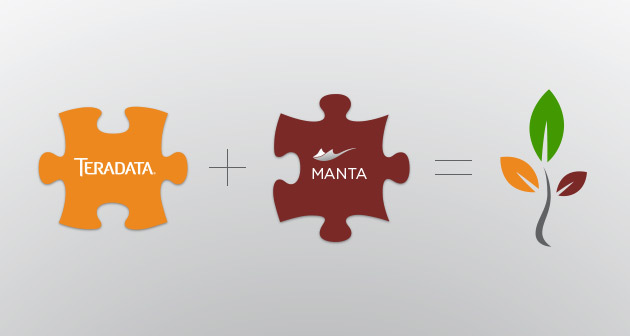 Since we announced our partnership with Teradata, we’ve been asked many, many times for a brief summary of how solutions that run on Teradata can benefit from deploying Manta Flow. Organizations need to automate what they do and get rid of manual labor as much as possible. Boring and repetitive tasks, when done manually, are the greatest source of ineffectiveness and errors. One example is analyzing business logic hidden inside custom code. Yes, it is hard but necessary to extract and manage metadata from code. We can’t count on developers to document it. And it is not enough to cover 60% or even 80% of that logic. Manta Flow can help with that – automated data lineage can help not only with overall data governance, but with documentation for regulatory compliance as well. Technical Insight: What exactly is Manta Flow able to extract? Manta Flow extracts a Teradata database dictionary via a JDBC connection reading these tables: DBC.DBase, DBC.TVM, DBC.TVFields, DBC.Indexes. Manta Flow also extracts DDL scripts of views, macros, and stored procedures from selected databases using the statements SHOW VIEW/MACRO/PROCEDURE. More and more organizations are shifting their Teradata-dedicated resources to perform higher value activities. The main reason is they do not want to lose Teradata’s outstanding performance, but they are frustrated by performance degradation caused by routine ETL workloads. Many of them choose Hadoop, which solves their ETL nightmare, while allowing them to keep all the benefits of Teradata’s powerful database solution. And Manta Flow is able to help with that – complete data lineage and sufficient documentation can speed up off-loading projects by hundreds of percent. Technical Insight: Manta Flow is also able to inspect Teradata database query logs (known as DBQL) which can help with off-loading projects (including specific statistics, your own rules how to select offloading logic, etc.). “One day an analyst gets a change request to analyze. The sales department has come up with a new line of products that have super-cool names that unfortunately do not fall within the current maximum length for product names. Automated analyses, provided by Manta Flow, can reduce the time spent on such investigations by 90%. Does this sound too good to be true? Yes. Can Manta Flow actually help with all this stuff and maximize the value of your Teradata-based data warehouse? Yes. Ask for our free trial and test it yourself. Email us at manta@mantatools.com or fill the form on the right.